Our range of products include floor operated stacker cranes. Compactly designed and precisely engineered by eminent vendors, the offered Floor Operated Stacker Cranes are one of the best that are available in the market. Made available to clients at an affordable rate, the cranes are highly demanded. Owing its extraordinary load bearing ability, the offered cranes are widely used in order to lift heavy objects. 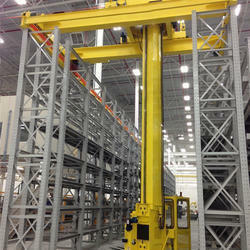 Looking for Floor Operated Stacker Cranes ?